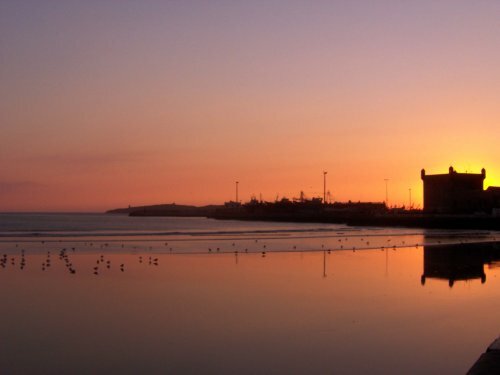 Board an early morning ferry to Tangiers, Morocco, and upon arrival, transfer to Tétouan. 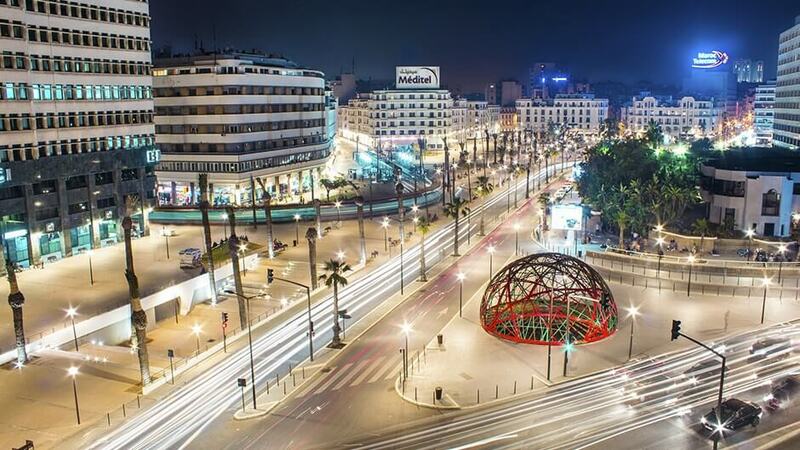 Of particular importance in the Islamic period, from the 8th century onward, the city served as the main point of contact between Morocco and Andalusia. After the Reconquista, it was rebuilt by refugees who had been expelled by the Spanish. The Andalusian influence is clearly displayed in the art and architecture. We will spend the afternoon on a walking tour of the old city. The Medina of Tétouan, a UNESCO World Heritage site, is surrounded on three sides by 3 miles of towering walls with seven gates. Although one of the smallest in Morocco, it has been relatively untouched by the outside world over the centuries. Carved into the hillside overlooking the medina, the Jewish Cemetery contains some of the most elaborate tombstones in the region. 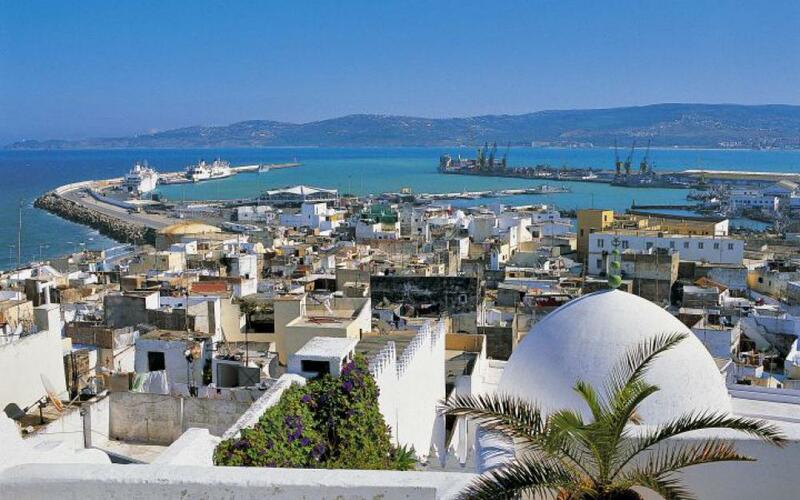 Continue on to the town of Chefchaouen and overnight for one night in the Riad Dar Echchaouen. 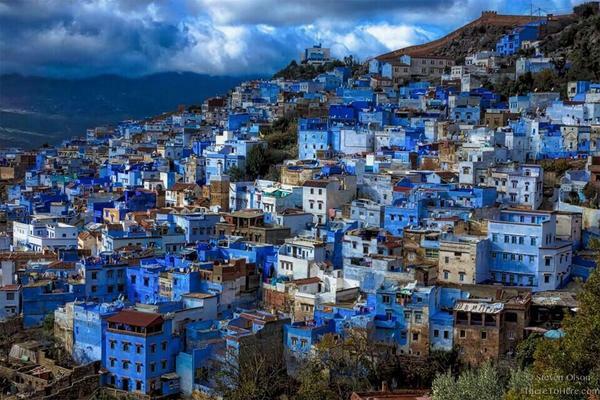 Explore Chefchaouen, a lovely town with buildings painted in many hues of blue located in the heart of Morocco’s Rif Mountains. Many Moriscos and Jews settled here after that Spanish Reconquistain 1492. We will enjoy a short walking tour of this lovely village, and then have lunch in a local restaurant, before continuing through the mountainous landscape to the Royal City of Fès where we spend two nights at the riad la Perle de la Médina. Dinner is on our own. 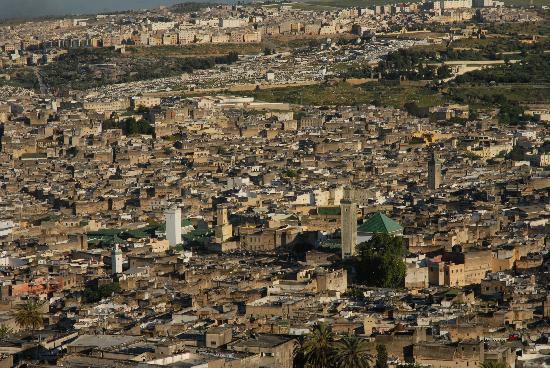 Founded in the 9th century, Fès is an outstanding example of a medieval town created during the very first centuries of the Islamization of Morocco. 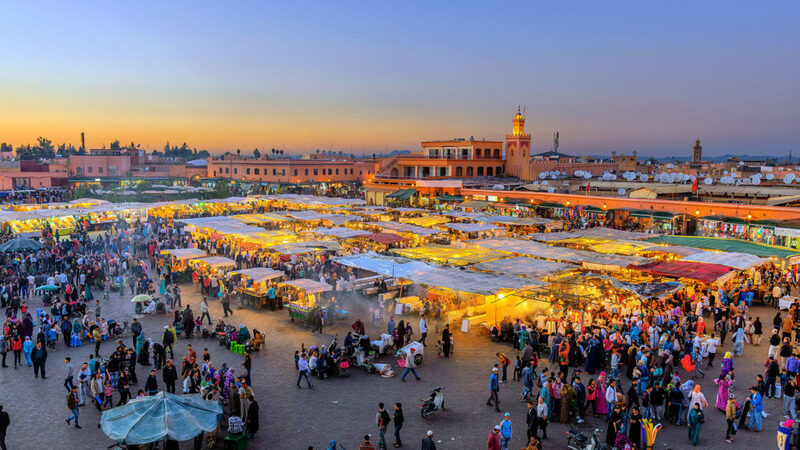 Our day will be spent exploring the medina, or old city, completely enclosed by formidable walls and a maze of narrow streets filled with private homes, shops, palaces, mosques and fountains. We will enter two madrasas, lavishly decorated theological colleges. Bon Inania Madrasa is considered the finest and features fabulously carved cedar wood interiors, classic Zellig tile work and a stunning marble courtyard entrance. Madrasa el-Attarine was completed in 1325 and displays exquisite carved stucco designs along with a specialized technique of tile cutting called taqshir. 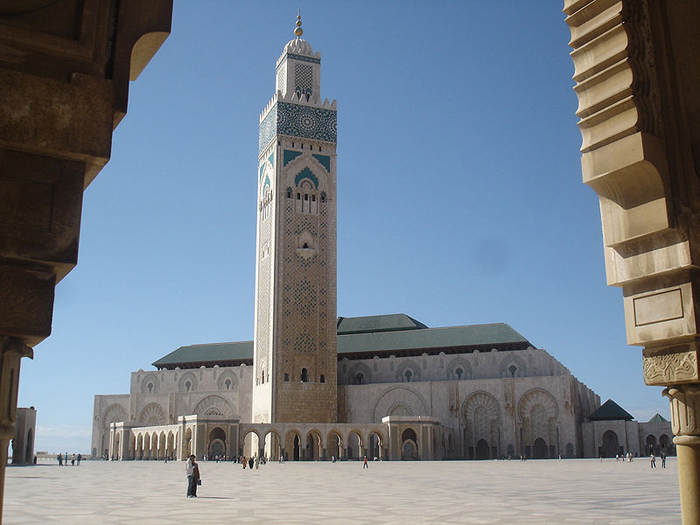 We will examine the spectacular entrance of Dar el-Makhzen, the Royal Palace, and the outside of Kairaouine Mosque which is closed to non-Muslims. It was established in 859 by a wealthy refugee woman from Tunisia and was expanded by the Almoravids in the 12th century. As we wander through the souk, or market area, we will stop to see the tanneries, a Fès institution little changed for six centuries. Leather workers can be seen pounding animal hides with their feet or dipping skins into huge stone vats of colored dyes. The process will make us appreciate our leather jackets! Nearby Fondouk el-Nejjarine, now the Museum of Wooden Arts and Crafts, is a Fès landmark, an exquisitely restored former caravanserai that once provided food and shelter to traders during the 18th century. Dinner is on our own. 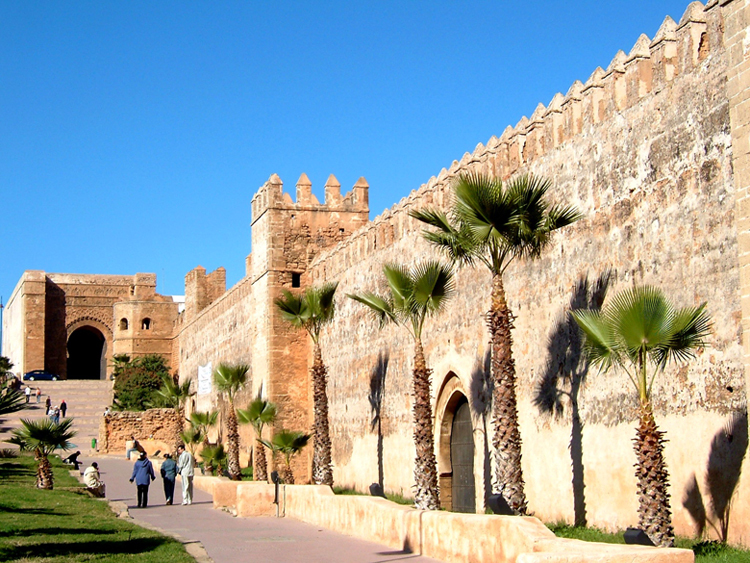 Depart Fès and drive west to see two UNESCO World Heritage Sites – Meknès and Volubilis. Founded in the 11th century by the Almoravids as a military settlement, Meknès became a capital under Moulay Ismaïl who, in the 17th century, turned it into his capital using a blend of Andalucian and Islamic styles. This impressive Imperial City is enclosed by high fortification walls with nine large and beautiful entrance doors. 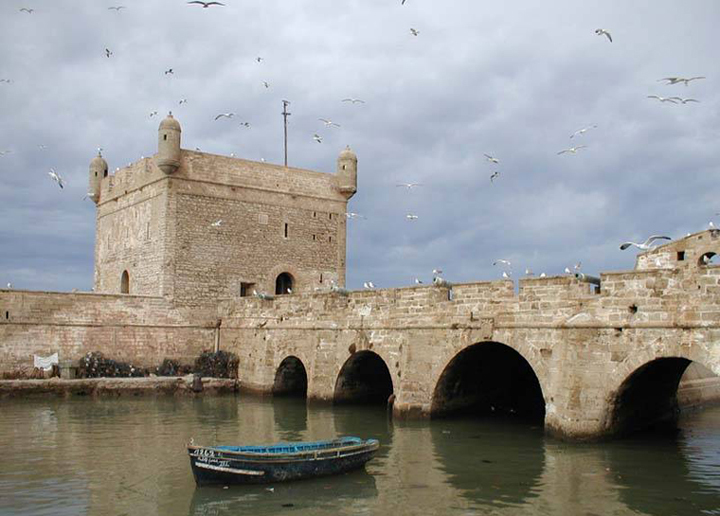 Here, we will visit the mausoleum of Moulay Ismaïl, considered one of Morocco’s greatest rulers, and Heri es-Souani, the sultan’s royal stables constructed to house twelve thousand horses. Then it’s on to Volubilis, an important 3rd century BC outpost of the Roman Empire. Continue to Rabat and overnight at the riad dar El kebir. 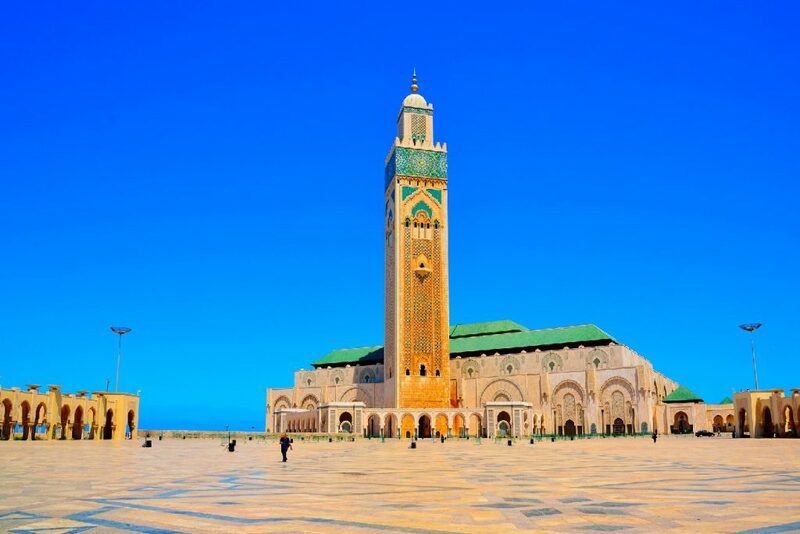 Rabat, the third of the Four Imperial Cities of Morocco, has been the country’s capital since 1956, and we will spend the morning seeing some of the city’s highlights. The Kasbah of the Udayas was settled by refugees from al-Andalus and is a UNESCO World Heritage Site. We will enter the immense fortifications through the enormous 12th-century Almohad gate of Bab Udaya, and wander the narrow residential streets lined with whitewashed houses. Housed within a luxurious 17th-century mansion, the Udaya Museum displays traditional arts. 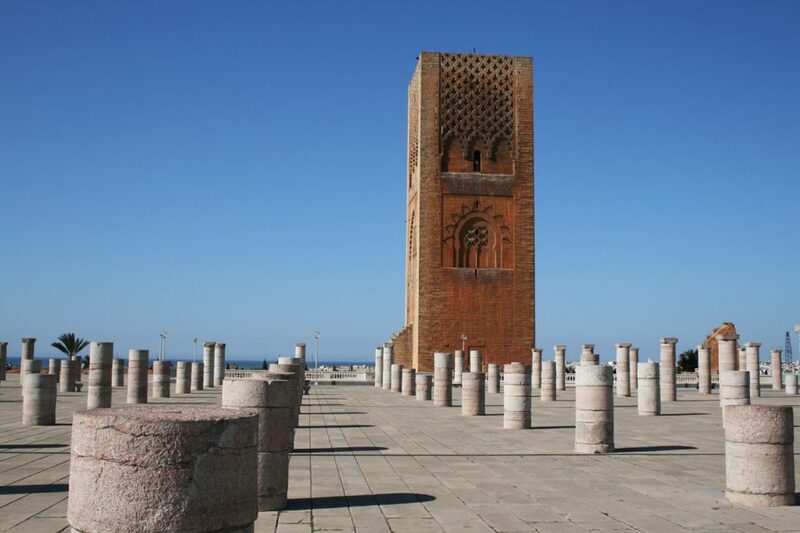 Begun in the 12th century by the same Almohad ruler who build La Giralda in Seville, the Hassan minaret and immense unfinished mosque has become Rabat’s emblematic landmark. 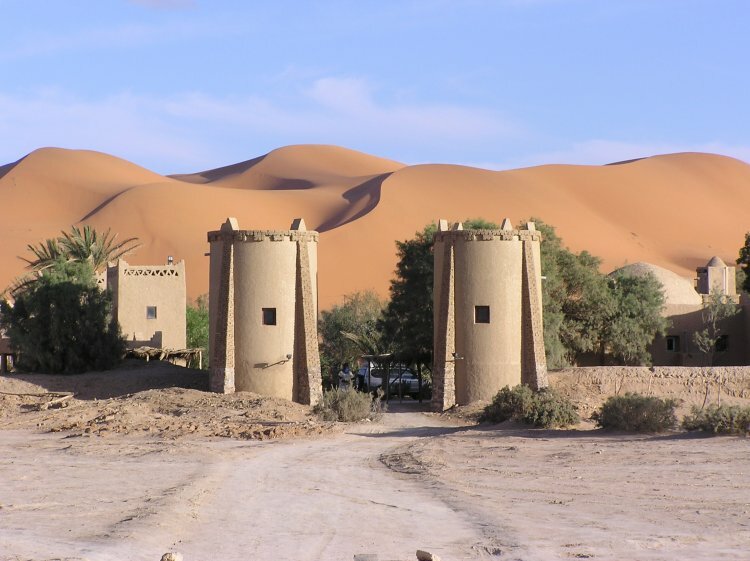 After lunch, drive to Marrakech where we will spend four nights at the hotel Atlas Medina. Marrakech, the last of the Imperial Cities we will visit, lies in a lush plain with the snowy High Atlas Mountains as a backdrop. The city was founded in 1062 by the Almoravids, and ultimately this Berber Dynasty expanded to include much of the Iberian Peninsula and present-day Algeria. 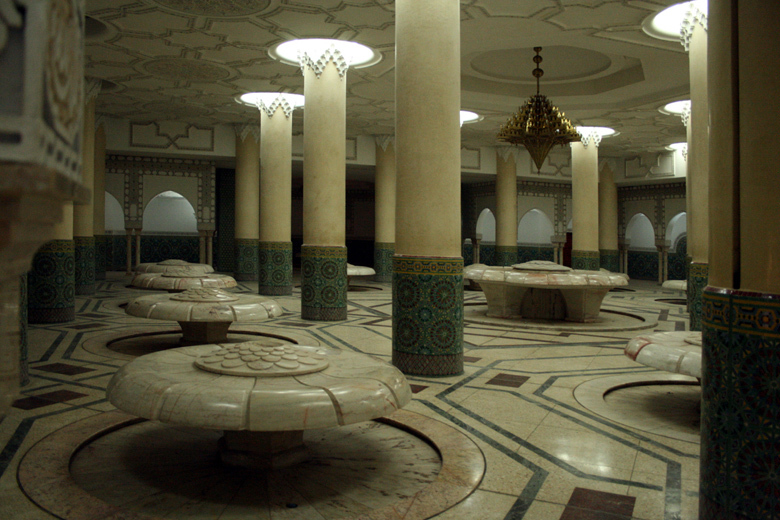 The ancient section, the medina, was designated a UNESCO World Heritage Site in 1985. We will spend today visiting many of the important sites. Set in a gorgeous complex of gardens, the 16th-century dynastic tombs of the Saadiens are among the finest examples of medieval Islamic art, not only for the dazzling stucco decoration but also for the finely carved cedar ceilings. 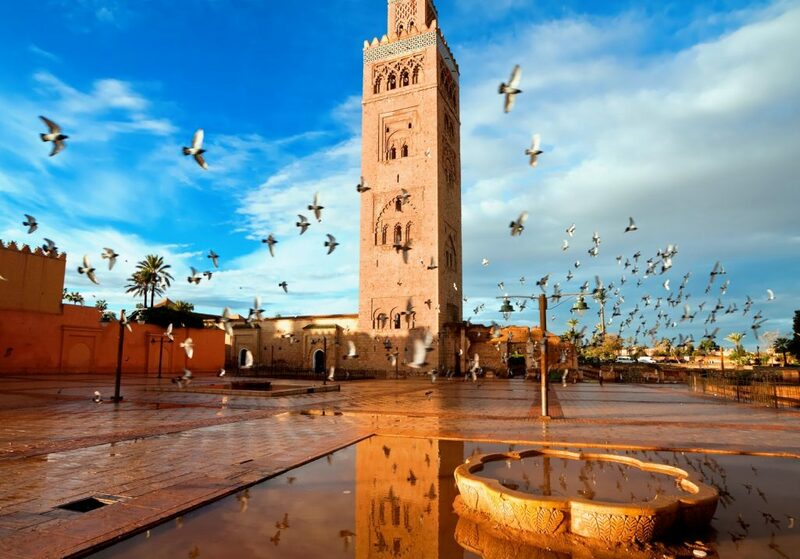 Koutoubia Mosque is the largest in Marrakech and is celebrated for its splendid minaret, the oldest of the three Almohad minarets left in the world today. We will walk by the entrance façade of the Royal Palace, and stop to see the remains of the Badi Palace. Although stripped of its finery, enough remains of the palace to appreciate the grandeur that once would have been revealed. 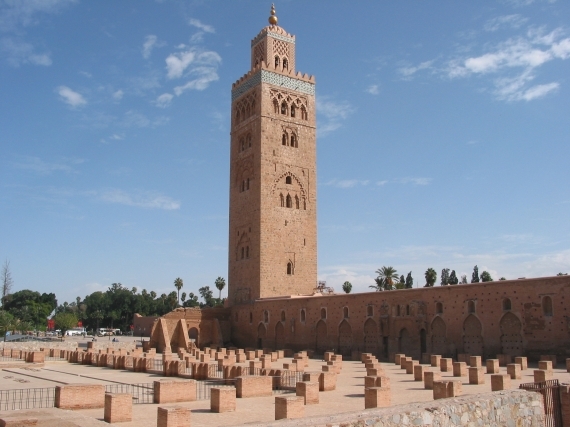 Built in the early 12th century, Koubba Ba’adiyn is the oldest building in Marrakech and the only Almoravid edifice to survive intact in Morocco. The decorative art represents Almoravid art at its peak. We will jump to the 19th century when we visit Bahia Palace, an excellent example of the style of the wealthy who lived at that time. Marrakech is noted for its many fine gardens. Majorelle Garden was the artistic achievement of Jacques Majorelle, and in 1980 the property was sold to Yves Saint-Laurent who restored it. We will stroll through luxurious foliage with streams and water lily-filled pools strikingly enhanced by cobalt blue walls to the Islamic Art Museum that houses North African artifacts from Saint-Laurent’s personal collection. In the 12th century the Almohad movement, another of the waves of caliphates that crossed into Spain, originated with Mohamed Ibn Tumart, a member of a Berber confederation of southern Morocco. This morning we will travel along a winding road through stunning landscape into the Atlas Mountains to Tinmel, a small village where Ibn Tumart proclaimed himself mahdi, the spiritual and military leader of his followers. The 12th-century mosque, listed on the UNESCO tentative list, was built to commemorate the founder of the Almohad Dynasty. 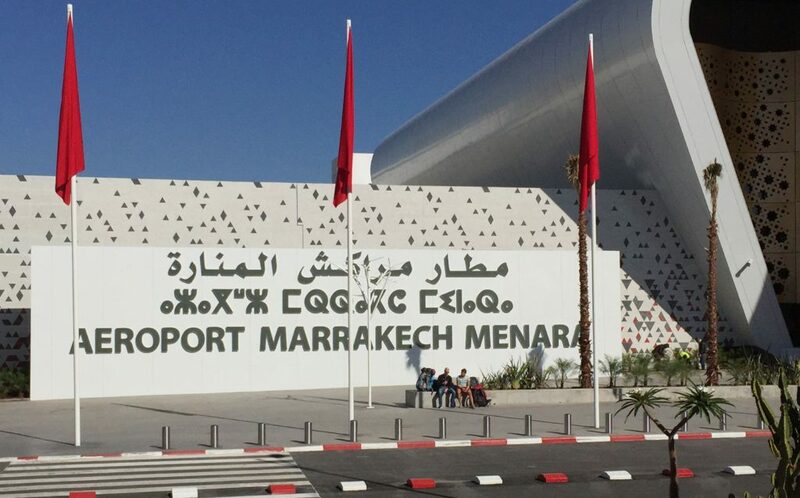 Return to Marrakech with the afternoon free to explore the souk. Gather this evening for our final dinner together. As we continue our explorations of Marrakech, we begin in Madrasa Ben Youssef, formerly an Islamic college named for the Almoravid sultan who expanded the city. An impressive example of Moorish architecture, it is evocative of the Alhambra in Granada and the Alcázar in Seville. The Marrakech Museum is housed in the 19thcentury Dar Me’nebhi Palace and displaying a fine array of Jewish, Berber and Muslim artifacts. Since the rule of the Almohad and Almoravid dynasties, the Medina of Marrakech has been surrounded by an unbroken circle of city walls, more than 10 miles long and containing 19 gates. 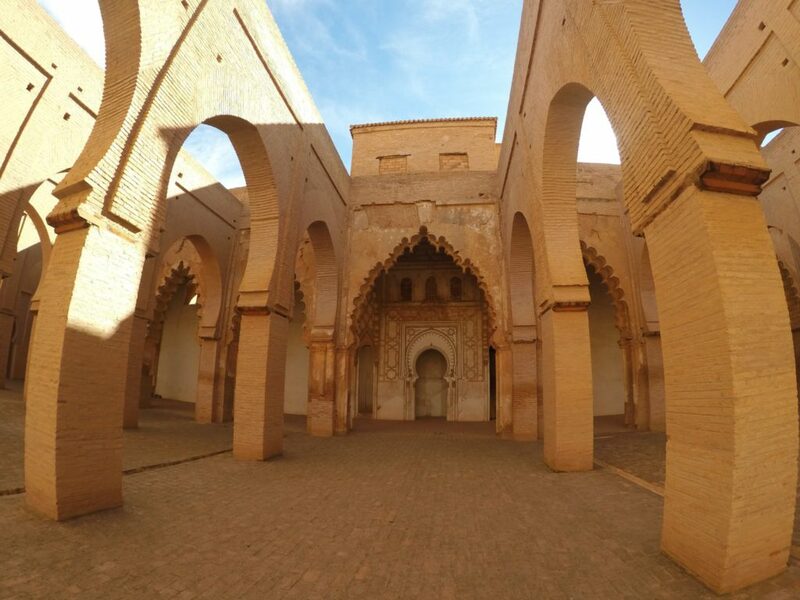 The most imposing entrance is Bab Agnaou, constructed in the 12th century by the Almohads and once the entrance to the Almohad Palace. For sunset, we will drive along the fortification walls and see several of the city gates. Dinner is on our own.